Happy Monday, mes chéries! I hope you all had a relaxing and fun weekend. I kickstarted mine with a delicious meal, bringing you all my first Picky Palates post. Picky Palates is my mini series for all restaurant reviews with photos and a specific category of ratings at the end. If you’re ever in town, you’ll know my favorite (and least favorite) places to try! The inspiration behind the Picky Palates series is not because I wish to be the Gordon Ramsey of critique but rather a celebration of my taste buds finally learning to grow the f*ck up. Basically, as a child my tongue was one unappreciative brat. I would only ever eat noodles, fuji apples, string cheese, ONE type of vegetables SPECIFICALLY cooked with garlic and salt, salt & vinegar chips, and sour gummy worms. For example, every time my family went to a Japanese restaurant, they would be indulging in a delicious and rather oversized sashimi boat platter as I picked all the yakiudon out of my plate, leaving behind every nutritious scrap of vegetables, mushrooms, and meat in the dish. (How I stayed stick skinny, I don’t even know.) I hated trying anything different. I even hated cake. CAKE, mes chéries. CAKE. I wouldn’t even eat cake FOR MY OWN BIRTHDAY. Thank God that nowadays food (especially sushi and sashimi) is a huge part of my life. I love trying new cuisines and different delicacies. The first few Picky Palates posts will be from Pittsburgh restaurants. I’ll be taking you to all my favorite places around New York this coming autumn. So without further ado, let’s head into this trendy Asian fusion restaurant, Social House 7. 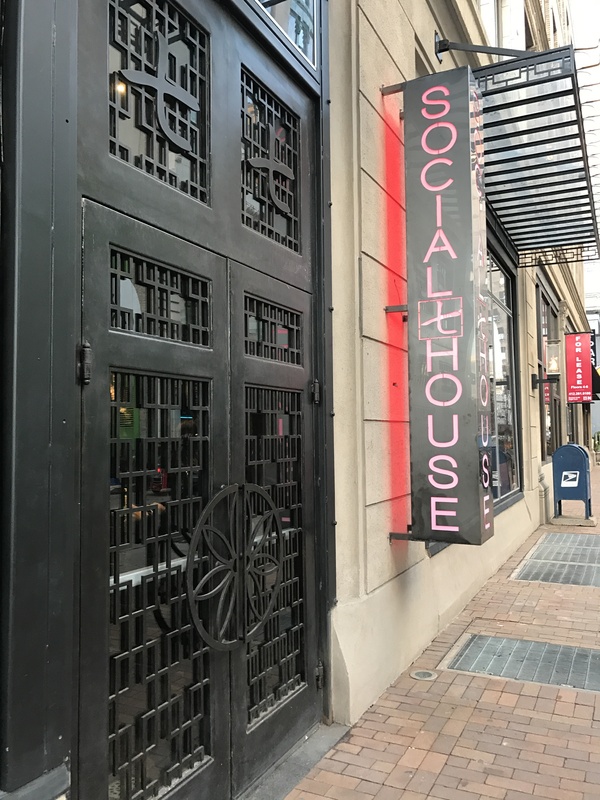 A few friends and I dined at a local restaurant, Social House 7, in downtown Pittsburgh this past Friday. SH7 is a Japanese izakaya-styled restaurant and “social house” where you can just wine (without the dine) with friends on beverages and Sake. The menu consists of Japanese, Korean, and Thai infused plates with a sushi bar and robatayaki grill. For those of you who may not be as accustomed to Japanese cuisine, robatayaki grill (often shorted to robata) is when food items, usually meat, are on skewers and slowly grilled over hot charcoal. The slow-grilling over the charcoal tends to bring out the food’s natural distinct flavors wonderfully. 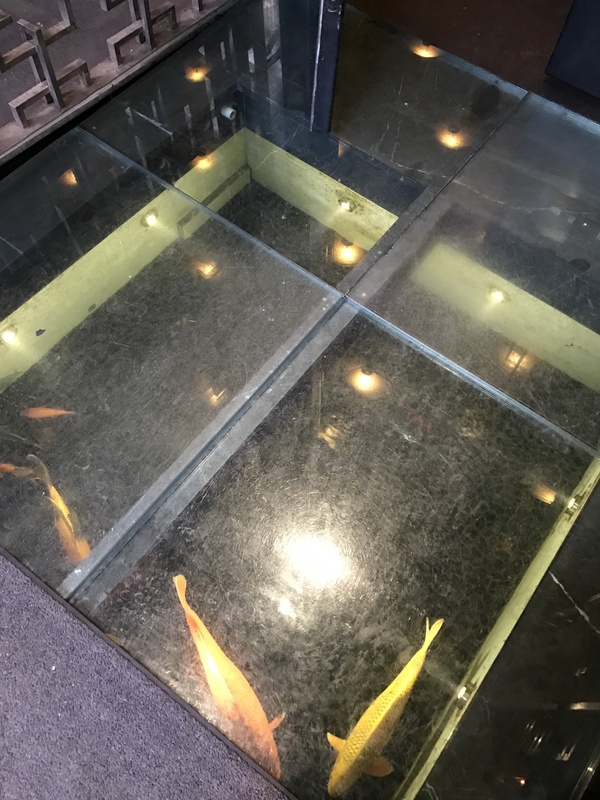 When you first walk into the restaurant, you’re greeted by beautiful koi fish under your feet and then into a large dim-lit room with dark wood furniture, atmospheric lighting, and red accents. There is also a large room on the right for large-party reservations that features a beautiful long table arrangement with a Buddha statue at the end. When the sun sets, there is often different color lighting features that shine on the Buddha, almost bridging the gap between ancient East Asian culture and religion with modern nightlife and Western culture. Overall, both dishes were great appetizers for us! I walked into this restaurant knowing it’s a bit more expensive, so splitting the price between two appetizers between my two friends and I made them even more enjoyable. The shrimp were my favorite because of the dual flavors you got from them. Oftentimes when you walk into a restaurant you don’t quite know if you’re feeling sweet or savory. With an appetizer that opens your palate and appetite, you can really decide from there on if you want to continue the sweet or savory flavors in your entreé. I think that the chef really did a great job with both. The only reason the Kobe Kimchee Wonton is missing one star each is due to the lack of kimchee flavor in the wonton. It’s a little hard to name something “Kobe Kimchee” if we don’t taste the kimchee, ouí? The sashimi was fantastic. The fish was really high grade, well cut, and fresh. I do wish that for $2/pc they were slightly more generous with their sashimi slices. However, I was already prepared for the slight price inflation so it did not bother me as much. I was determined to taste all aspects of their menu that night, with or without my precious uni. Here comes the main course of the evening, a savory dish and their special house beer. I was silly and forgot to write down what it’s called, but it’s a very light and easy-to-pair beer. Think of a lighter version of Blue Moon. It was I believe around $6, and I really enjoyed it! From this angle, it doesn’t seem like the plate comes with a lot of food for $16. I am promising you right now that this photo is as deceiving as our current President (sorry #MAGA fans). The amount of short ribs and yaki noodles on this plate was almost so large that I could not finish it. The reason is there was a perfectly even amount of short ribs to noodles, making the $16 completely worth it. After all, I’m in it for the short rib more than I am for the less expensive noodle component of the dish. The flavor was full and savory. The abundant amount of Kobe beef was filling and also fresh. It was a perfect texture and My only complaint was it was just a little bit too savory. I think there’s a fine line between savory and salty versus sodium-filled. If a dish is savory or salty in a good way, you will be able to enjoy all of it. Mine was a bit on the sodium-filled side where I got to the last quarter and felt myself already collecting water weight. Fortunately, that could have just been my dish seeing that my friend also ordered the same thing and hers was a little less salty than mine. Overall, less salt would be nice. I felt a bit squishier than normal the next morning. While I am happy with my dish, I noticed that their special sushi rolls looked especially delicious. They avoided the very basic combinations and put a little flare to each roll weather it’s through their plating or the ingredients. Most people seemed to be content and full on either one order of sushi rolls or one order with an appetizer, something I was not expecting. The next time I go, I will definitely opt for a sushi roll. While I’m not a huge dessert person, my friends were and insisted we each get one. I figured why not? I’m here for the full experience anyway! So we each ordered a dessert and shared them. There is only one dessert here that is worth getting. It’s the fortune cookie. First of all, it’s great for sharing because IT IS LITERALLY THE SIZE OF MY FAT FACE. Second of all, the mousse is so delightfully light that someone who hates sweet things, like me, would not even be opposed to it. Third of all, the other dessert dishes are too complex and almost trying too hard to be special. The Japanese Cotton Cheesecake is very authentic in textures and flavors but they all don’t match well enough to create a distinct flavor to the cake. It was so light that it became more of a good palate cleanser after a sodium-filled meal than a dessert dish. If that’s what you’re looking for, I would still probably recommend it because it is still quite enjoyable. The fruit sushi platter was the biggest disappointment. The plating is beautiful and the idea is something I fell in love with. However, reality is that the only type of sushi that should exist in this world is normal sushi. No more of this fruit sushi/candy sushi crap that I often see. The fruit sushi was made from sweet sticky rice, soy paper, strawberries, mango, and two unidentifiable canned Asian fruits diced up. For the amount of fresh Asian fruit I’ve eaten in my childhood, this is quite unsettling to me. It’s beautiful on a plate, but terrible to the tastebuds. My mouth was so confused as to why there was no salmon but a ton of weird crunchy and sugar coated fruit with the rice. The sauce was supposed to be plum sauce, but instead tasted like a mix of fruit and sticky soy sauce, triggering a series of just cringes. However, the one great component on this plate is the green tea mousse, leading me to believe that SH7 is just a star at making mousse. Notes: Should you come here if you’re in town? If you’re craving unique fusion dishes then yes! If you are here for a specific type of cuisine or large sushi meal, no. This place is definitely more of a social lounge with an izakaya (drinks, tapas, sharing dishes) dining style rather than a sit-down restaurant. Come here if you want to have some great bites or dishes over drinks with friends.